Even more powerful than his description of the land that he grew up in is the way he evokes his parents and their family life. When his father builds them a one-room house on top of an abandoned car, he tells us the house was “a short loaf of bread on wheels. Inside it was a warm cave of conversations. Mexican songs and auctions blared from a box radio on the wall.” The wonderful artwork on this page makes you feel like you are nestled in that cave listening to the music and family chatter. His mother and his father are both full of wonder—his father knows birdcalls that bring the doves to him, and his mother recites poetry over dinner and heals injured sparrows and the neighborhood children. Simmons’ artwork is beautiful; she uses colored pencils, casein, and acrylic paints on rag paper to render the soft, vibrant, colorful land of Herrera’s childhood. The characters have expressive, human faces that make them compelling and relatable. These are bold, often whimsical paintings that would look just as stunning hanging on a wall as they do in the pages of a children’s book. I would certainly love to have one in my own living room! Calling the Doves reads well in both Spanish and English, something I have come to think of as one of the hallmarks of Herrera’s work. There are ways in which the languages interweave. In Spanish, there is the distinct mark of English in terms like “troca del Army” (Army truck) and “trailas” (trailers), which helps set the book in California. Spanish words, like carpa, plantillas, campesinos, and fiesta, also work their way into the English text. There are a few awkward moments, especially when it comes to the long translations of food names. For instance, “huevos de papas o huevos revueltos” becomes “huevos revueltos—scrambled eggs or fried eggs with potatoes.” But ultimately I appreciate that the Spanish and English versions seem interdependent. For anyone growing up speaking Spanish in California, the two languages are interwoven, and this is true in Herrera’s writing as well. Calling the Doves could be read to children as young as Kindergarten, but could also be used with much older children to study metaphor and simile. The best part is that, if your students are curious about what happens to Juanito once he goes to school, you can pick up Upside Down Boy / El niño de cabeza—an equally beautiful sequel. 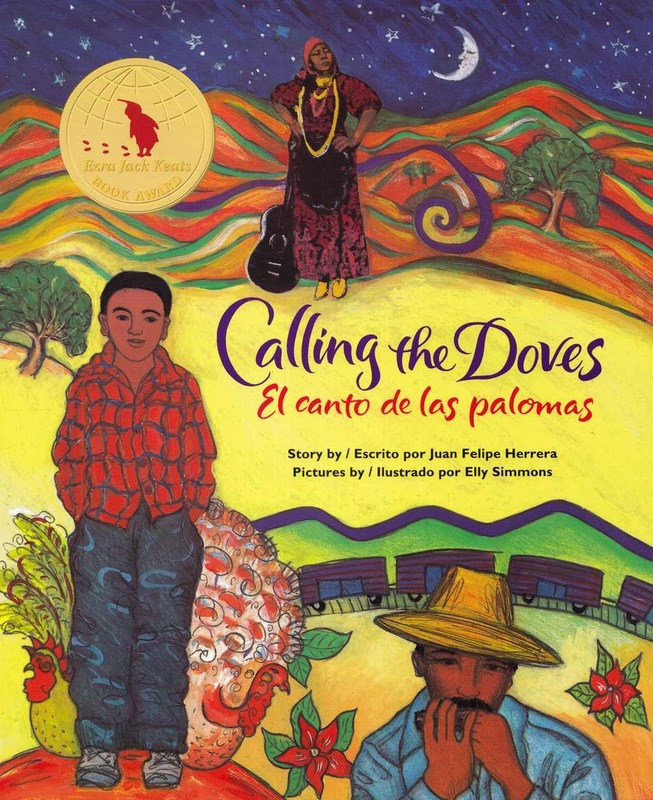 Calling the Doves / El canto de las palomas is highly recommended.